Dicranales possibly could be mistaken for Polytrichales by the beginning bryologist, but the leaves of Dicranales are often much narrower than in Polytrichales and a careful check with the lens or microscope will show the midrib in Dicranales has no lamellae. The leaves are broadly lanceolate to subulate (awl shaped), sheathing at base and the nerve maybe excurrent, leaves occasionally with hair points. 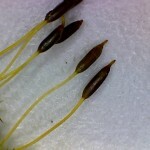 If present, the capsule is erect or inclined with cap-shaped calyptra and the lid is usually beaked. About 600 species world-wide, commonly found on the ground, rocks or on tree trunks. Dicranoweisia cirrata – is recognisable from its neat, round cushions and erect, sausage-shaped capsules (green becoming brown with age) and beaked lid. It is a very common epiphyte on trunks or larger branches in woodland also wooden fences and gate posts. 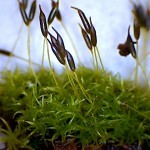 Campylopus introflexus – one of the few successful non-native mosses to have taken hold in natural habitats in Britain in the last 50 years or so. 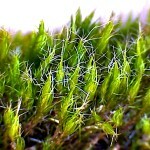 It forms tufts or carpets in heathland and other usually dry acid habitats and is recognised by the divergent hair-points of the upper leaves forming cross-shapes when dry. The featured image at the top of this post is Dicranum majus, a large and robust member of the Dicranales with slender, pointed and recurved leaves found most commonly in acid woodland to the north and west of Britain. 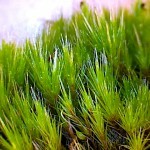 I don’t know if you have seen this documentary on bryophytes: Bryophytes, the secret plants which surround us. Thanks Tim. I’ve recently moved to Devon so plan to get in touch with the Devon Bryophyte Group and hope to join their field trips in the future. That was very useful.